UF Health North blends leading-edge care with the comforts of home. 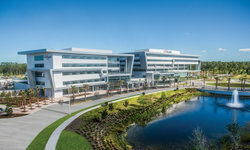 On May 23, two years of anticipation came to an end when the doors to UF Health North’s inpatient hospital opened to the public. What patients and visitors will see is far from the cold, sterile environment many expect in medical facilities. 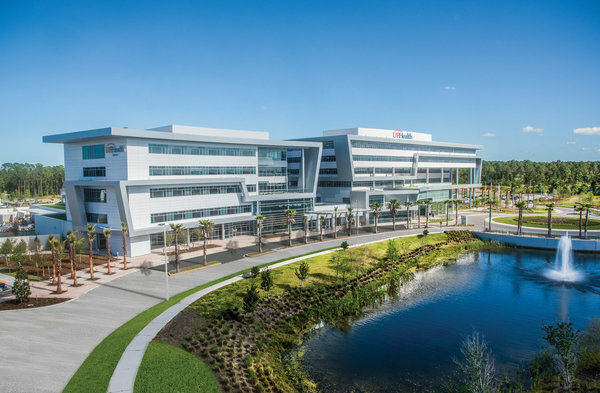 Instead, UF Health North is warm, welcoming and designed to promote patient healing. 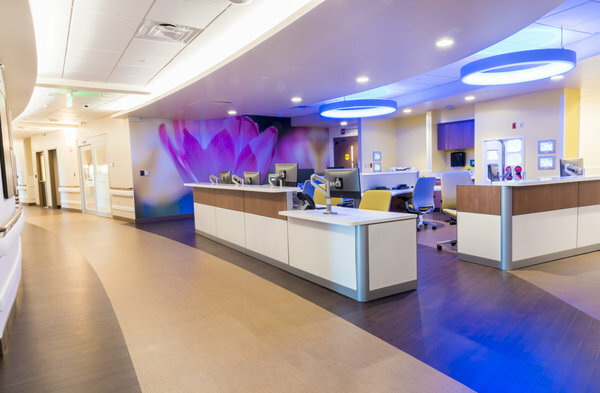 The hospital is home to 92 private patient suites, equipped with interactive technology called SONIFI. A tablet and pillow speaker synced with the 55-inch TV in each room allow patients to watch television and movies, order meals and contact nursing staff. Many waiting lounges are connected to balconies, so visitors can get fresh air. Two floors connect to the neighboring medical office building for easy transfer and patient navigation. 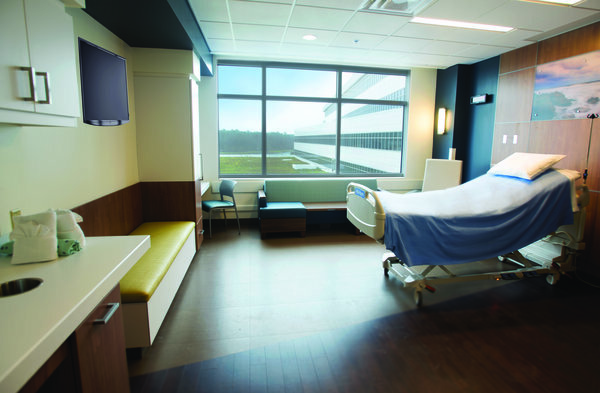 Suites at UF Health North are designed to make patients as comfortable as possible while they heal. That’s one reason private rooms were a key element of the construction, and why each room has numerous windows to fill it with natural light. 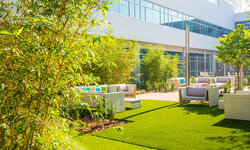 Studies associate green space with increased energy and positive emotions, so each suite also has a view of the outdoor courtyard, pond or rooftop succulent garden. UF Health North has 12 inviting labor and delivery suites, opening in late summer. They also serve as recovery and postpartum rooms, so mothers can remain comfortable during their stay. The nursery is located directly next to the nurses’ station, but the suites are spacious enough for the baby to remain in the mother’s room while still accommodating family and friends. Three of these suites feature hydrotherapy tubs for water births, a unique addition in a hospital setting. Just around the corner from the labor and delivery suites are two dedicated obstetric operating rooms for mothers in need of a planned or unplanned cesarean section. Like the medical office building, the hospital has a contemporary design that draws on the wetlands in the region. A wall relief depicting the St. Johns River flows from the lobby on the first floor up to the fifth floor. The magnificent artwork is visible from the exterior of the building through the front windows. Pieces from local artists decorate the interior, including murals near nurses’ stations and photography used as cabinet doors to conceal medical supplies. 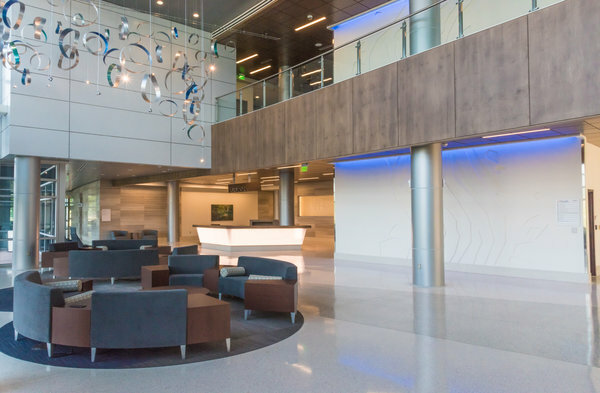 Additionally, the hospital is built to meet LEED Silver Certification standards of sustainability and green design. On each patient floor, the hub of activity is the nursing collaboration station. It’s there that nurses, providers and staff can discuss various cases, and guests can find assistance at any time. The hospital’s first floor houses a full-service cafeteria with indoor and outdoor seating, and a café with a coffee bar down the hall. The spacious courtyard features seating surrounded by greenery. The chapel is nearby, with plenty of windows for sunlight. Four conference rooms are available for public use to hold meetings and can be opened into a single space for larger events. Additional parking has been added next to the inpatient tower for visitors’ ease of access, and a private discharge elevator is nearby for patient pickup.